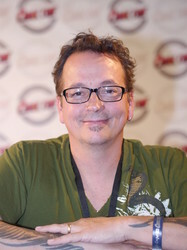 As co-creator of the Teenage Mutant Ninja Turtles, Kevin Eastman has cemented his status as an entertainment icon. Beginning in 1984 as one issue of a black-and-white indie comic, TMNT soon became a pop culture juggernaut, conquering all media (as well as toy stores). As if that wasn't enough, Kevin is also owner, editor and publisher of the infamous illustrated sci-fi/fantasy magazine Heavy Metal as well as a noted photographer and art collector. Not too bad for an ex-lobster cook from rural Maine.